April 10, 2019: Fortnite Reboot Vans (along with the rest of patch 8.30) are now live. Fortnite’s long-awaited respawn mechanic has finally made it into the game. Reboot Vans went live earlier today with the release of the latest update, allowing players to bring their fallen squadmates back to life. As early hints suggested, the system works much like the revival system in Apex Legends, although Epic’s take is a little more generous. While Respawn’s battle royale allows players to return to the game but strips them of all of their gear, Fortnite offers a grey pistol, some light ammo, and 100 wood – enough to make sure you can get yourself out of a tough situation, but not enough to ame it easy. Dying in squads or duos (but not solos or LTMs with respawns already live) means that you’ll drop a Reboot Card (previously referred to as a Second Chance Card) that lasts for 90 seconds. 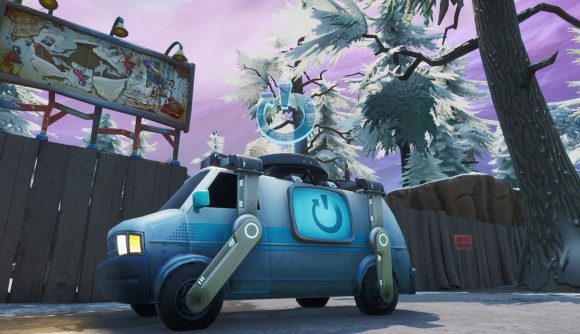 If a teammate picks it up and brings it to a Reboot Van (again, previously known as a Second Chance Van), you’ll be able to drop back into the game. Happily, cards won’t take up an inventory slot, and vans can be found at all major points of interest in the game. A glowing mark and audio cue will let nearby players know that a respawn – which takes 10 seconds – is in progress. If you’re respawning multiple teammates, they’ll come back one by one, and after a reboot the van will be unavailable for 120 seconds. You can see the mechanic in action (along with a man in a banana suit) in the video below. Fortnite pulled the concept after the success of PUBG, Apex Legends and PUBG both took the battle pass from Fortnite (though let’s tip a hat to Dota), and now that even the respawn system is crossing games it seems there’s no end to the cribbing. The rest of Fortnite patch v8.30 nerfs the Infantry Rifle and adds the new Buccaneer’s Bounty event, which drastically increases the chances of Fortnite treasure maps dropping, thereby offering players the opportunity to get their hands on some impressive buried treasure.